Being a teacher these days is not even remotely easy. The nonsense we have to deal with from developmentally inappropriate standards to endless meetings and data to no lunch or bathroom breaks are nothing short of lunacy. Throw in an unruly class with some serious behavior problems and you have a recipe for early retirement. The trick is to make what happens inside that classroom with those kids as joyful as possible so that the rest of the crazy in our profession will be easier to manage, We must try to shelter our students and ourselves from the stress and pressure. 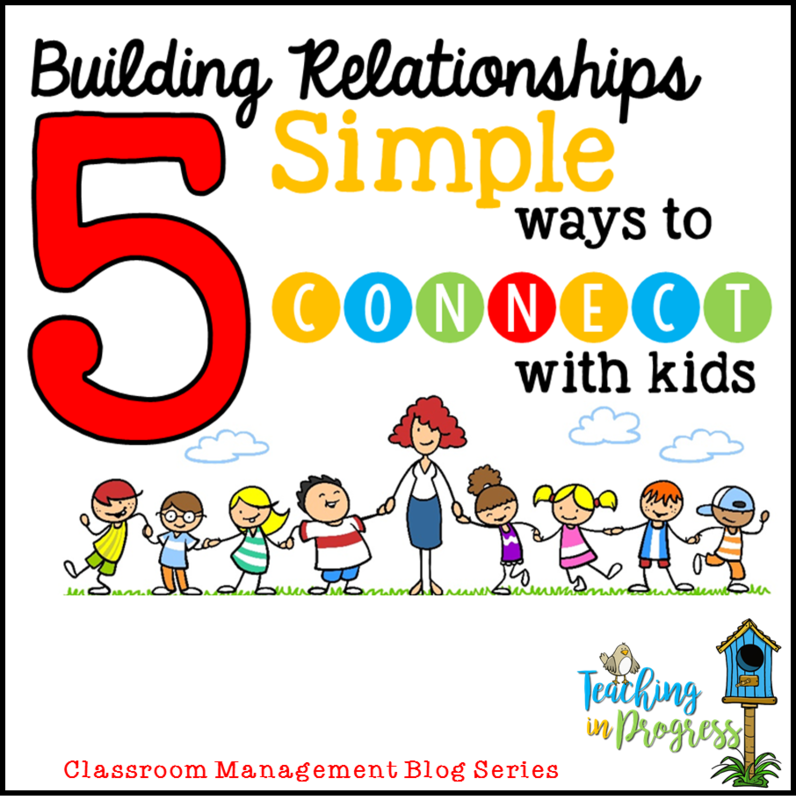 We all know that achieving that classroom nirvana of peace and productivity requires an authentic connection with our students. When our students feel loved and understood, they feel safe. Safe enough to take academic and social risks. Safe enough to try and fail. In a close knit, loving environment, failure is part of the process, not an embarrassment. But how do we form those genuine, loving relationships? There are many layers to that question, but I have complied a list of some of the ways I try to connect with kids in my class. Nope, not email - Tmail! This is a small space set up for kids to write a note to the teacher. When the flag is up, I know I need to check for a note. I usually reply and leave it in their folder or hand it to them personally at the end of the day. The kids' faces light right up when they get that note back from the teacher! They feel so special. 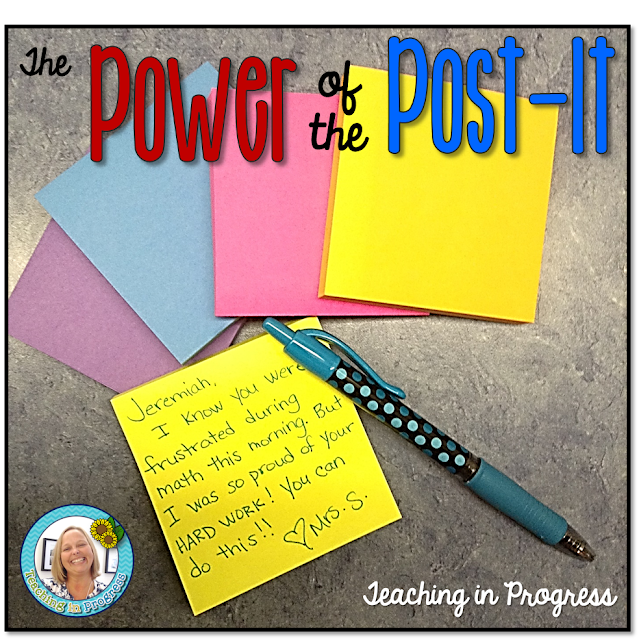 At the beginning of the year, I grab a a pack of colorful post it notes and write each student's name on one. Over the next week, I jot a note and give it to the child. It might be a note of praise for working hard or a note of encouragement after a rough day. By labeling them at the beginning of the week, I ensure that every kid gets one. When all the notes are gone, I label another set of notes and start all over. I bought small, 2 x 4 inch spiral notebooks at the Dollar Tree 3 for $1.00 and labeled one for each student. They keep it in their desk. Students write a note to me, leave it on my desk, and sometime that day or after school, I write a reply. We can write back and forth to each other as little or as often as the child likes. I have had kids ask me about my family, tell me about a conflict with another kid, share a joke, tell me how things are at home, or even just draw a silly picture. I love it when I see a notebook appear on my desk! I like to greet the kids as they trickle in the room from the bus and cafeteria. It's easy to get busy prepping for the day, but taking a few minutes to say good morning, ask how baseball practice went or share a tale about your commute, allows kids to gently, and socially, settle in. I'm a huge fan of well taught procedures to keep things running smoothly, and part of that procedure is having a moment at arrival to speak with friends and have quick chat with the teacher and each other. They need time to greet and chat informally before the morning work and announcements and morning meetings begin. It's the same thing I do when I come in to the office in the morning - greet colleagues, chat with someone about their daughter's recital, get the latest news on the broken copier - then head on to class. Have breakfast or lunch together. 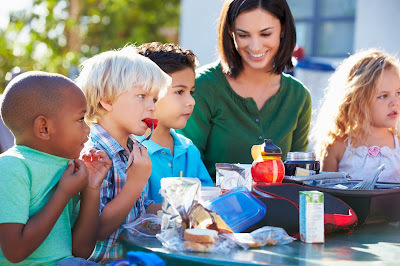 Sometimes I eat in the cafeteria with the kids, sometimes I take a few kids back to the room for lunch. On occasion, I bring my breakfast and have it in the room with the kids in the morning. We talk about stuff, tell jokes, complain about dumb siblings, argue about which video game is the best one ever in the world, and other really important topics. But seriously, it is probably the most valuable 20 minutes of our day. I don't do it every day because I really just need a break on many days, but a couple of times a week works for me. I actually enjoy it and we connect in a personal way that is often impossible during the jam packed day of lessons and tight schedules. How do you form honest, authentic relationships with your students? I love the post it note idea! 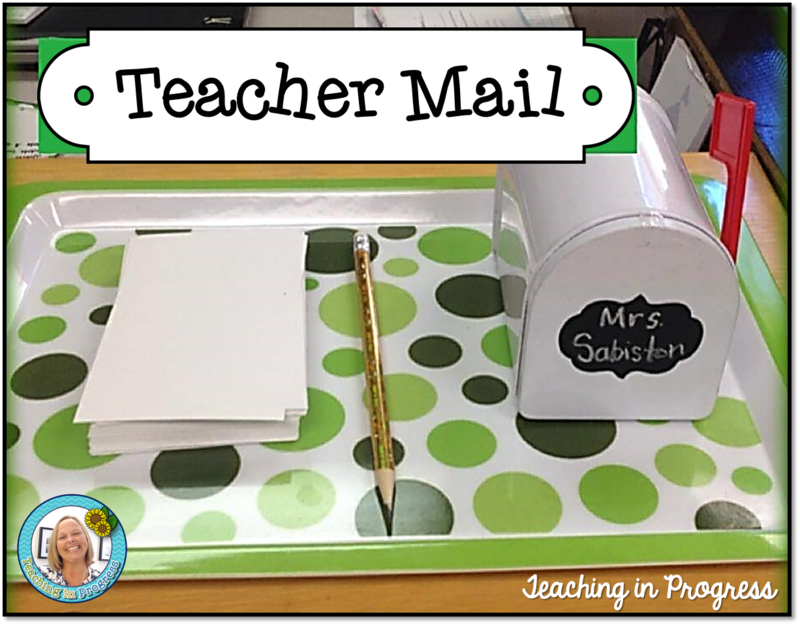 I absolutely love the post-it note idea, T-mail, and the conversation notebooks. Those are all great ideas. Thank you for sharing them! I absolutely love all of these. I especially love the post-it and conversation notebooks! i like the T-mail idea..thank a lot! I also eat lunch with the littles ... at least once a month. It's a great way to get to know then better! I love your t-mail and post-its ideas!! However, I do have a quick question....what are the rules or procedures for using the T-mail? I teach 4th grade and I'm thinking of those students who would use that as more of a way of tattling. How do you introduce this to your students? At the beginning of the school year, I have a BYOP (Bring Your Own Picnic) at a park close to school. I set a time period of 2-3 hours and Encourage students to come by with their families for 5 minutes (or 15, 30, 60 whatever time they have to spare. I mail the invitations to them at home the week before school, (when I finally know my list). It also helps families to get to know each other! 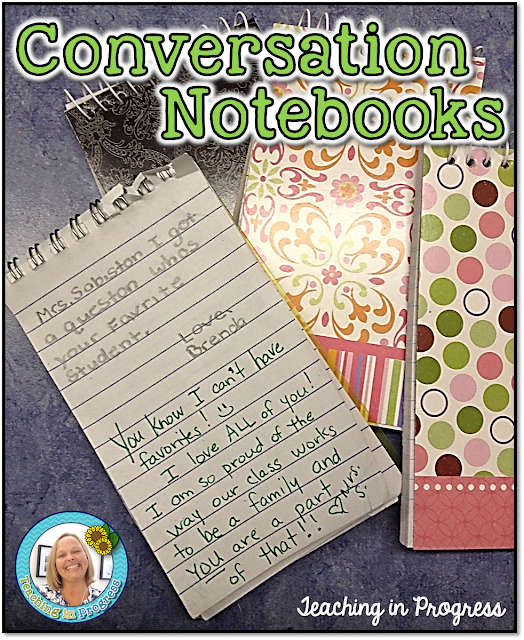 I want to thank you for the idea of Conversation Notebooks. Tried them this year and they're a miracle! Kids love them and so do I! It doesn't even feel like extra work - they're fun. And they are a great way of connecting. THANK YOU so much! very helpful, it can be used for small children in any educational campus. we can have one to one connection with them. I, always love all the ideas I get from all the overseas teachers. Sad to hear of no breaks. Here in South Africa teaching is a challenge on its own, I have 37 school beginners, 6-7 years, we have 2 breaks and they can go to toilet any time they ask, but I prefer making a toilet time for all. I am definately going to try the T-mail idea. Imagine 37 notes. That's gonna keep me busy.